Appleton Catering By Solea Mexican Grill. Call us for Business Drop Off Delivery anywhere in the Fox Cities. OFFSITE CATERING & FIESTA AT SOLEAS! Catering in Appleton, or Fox Cities is easy as 1-2-3. Choose our drop off service, or full service catering. Let Solea cater your next event at one of our venues, or offisite at your home or business. Make your next event professional, authentic and delicious with Solea's! 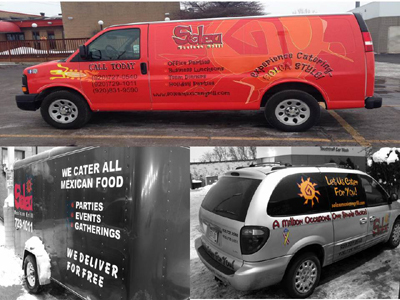 Always feel free to contact Solea Mexican Grill's catering representatives for any concerns, comments or questions. A well friendly answered response is promised. A contact agreement is required at the time of booking. All taxes are excluded from prices.